In this month’s free lesson we are providing you with a great old Irish tune, “Bonaparte Crossing the Rhine” as arranged by Tim May. Tim May and his wife, fiddle player Gretchen Priest-May, perfrom together in a band they call Plaidgrass. This band plays a wonderful combination of bluegrass, old-time, and Irish music. “Bonaparte Crossing the Rhine” is a song that they featured on their Plaidgrass CD, which was released several years ago. Additionally, Tim May and Dan Miller are getting ready to release a new book in February 2012 that features a selection of 20 Old-Time and Irish tunes. For each tune Tim and Dan have provided a melody-based version and a longer, more complex version. 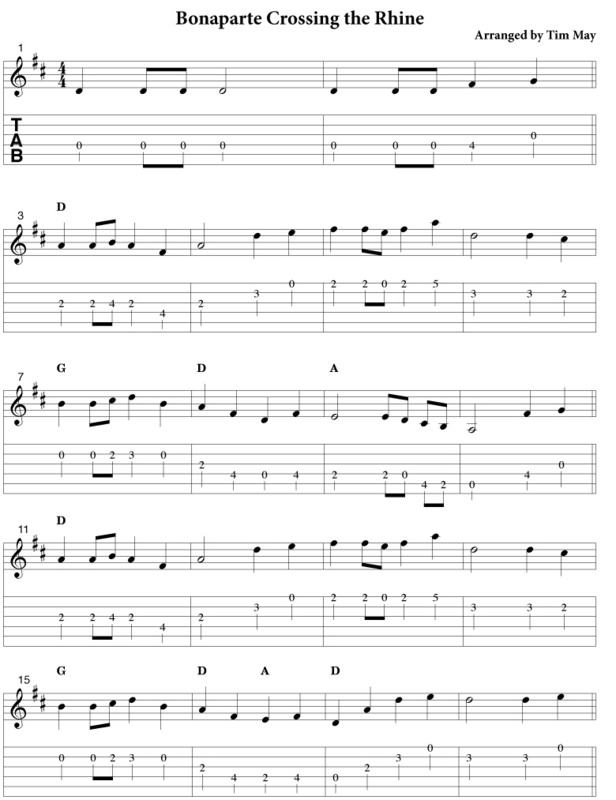 Additonally, for the Irish tunes they have provided alternative rhythmic ideas since in most Irish bands the lead instruments play the melody and the rhythm players provide the improvisation. Here we provide the melody-based arrangement of “Bonapart Crossping the Rhine” as it will appear in the new book.. This is a simple, and beautiful arrangement, that will be accessable to any flatpicker. 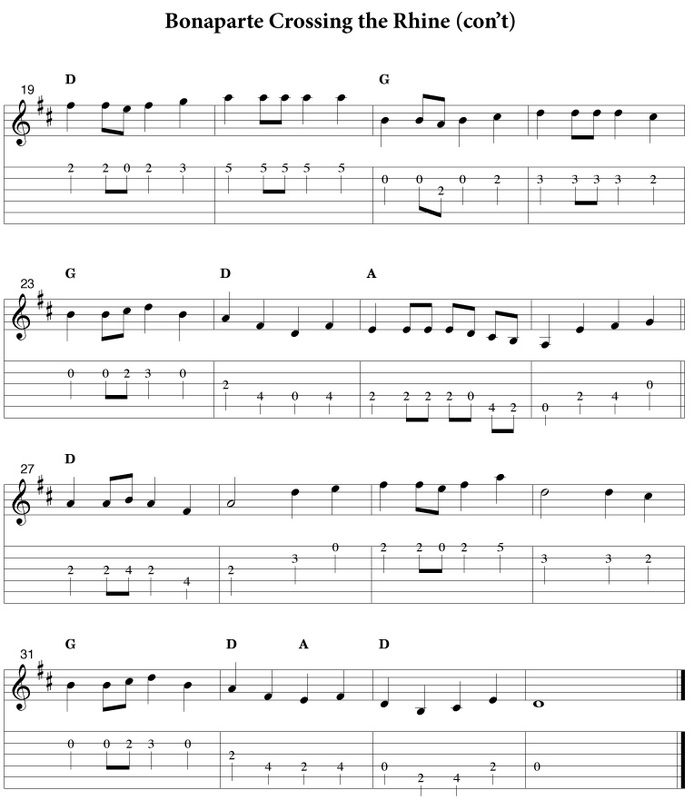 We hope that you enjoy learning this tune! While playing the melody to the “A” section, your left hand will be jumping between first and third positions. This is another one of those situations where striking the open high “e” string will be the moment when your hand jumps up two frets. When you play the second to last note in measure two (open “e” string), shift up to second position so that you can play the fifth fret with you ring finger. Then, after playing the last note in measure three (fifth fret “g” string), shift back down to complete the line. This technique is very common when exploring fiddle tunes on the guitar neck. What is done in one position on the fiddle/mandolin neck is often two or three positions when arranged on the guitar neck.